Activity for pre-schoolers and primary school children. Children below five years may need help in cutting. 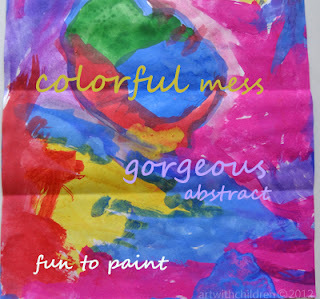 Watch the children as they create their own versions of this craft. My children enjoyed making these last week and we had an amazing collection of gorgeous butterflies on display! 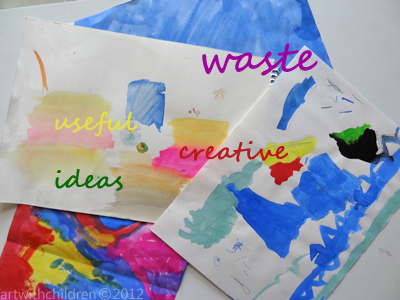 Waste paper - scribbled or smudgy ones. The ones as shown above can be used straight away! The gaps can be painted with various colors. Make them as colorful as you like. 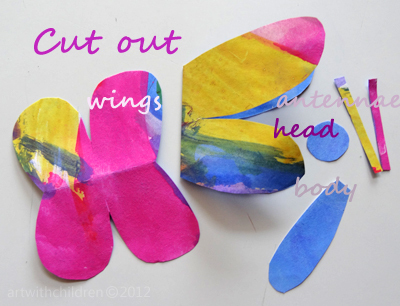 Fold the paper and cut them into bits of the required size. two long thin bits for the antennae. 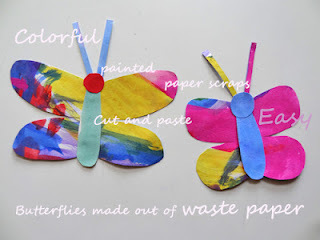 Stick them all together to make these lovely colorful butterflies. Create more butterflies and share them with us on facebook or send us a link to your website.